Charles Emmanuel II (Italian: Carlo Emanuele II di Savoia); 20 June 1634 – 12 June 1675) was the Duke of Savoy from 1638 to 1675 and under regency of his mother Christine of France until 1648. He was also Marquis of Saluzzo, Count of Aosta, Geneva, Moriana and Nice, as well as claimant king of Cyprus and Jerusalem. At his death in 1675 his second wife Marie Jeanne of Savoy acted as Regent for their eleven-year-old son. 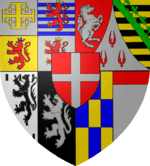 He was born in Turin to Victor Amadeus I, Duke of Savoy, and Christine of France. His maternal grandparents were Henry IV of France and his second wife Marie de' Medici. In 1638 at the death of his older brother Francis Hyacinth, Duke of Savoy, Charles Emmanuel succeeded to the duchy of Savoy at the age of 4. His mother governed in his place, and even after reaching adulthood in 1648, he invited her to continue to rule. Charles Emmanuel continued a life of pleasure, far away from the affairs of state. He became notorious for his persecution of the Vaudois (Waldensians) culminating in the massacre of 1655. The massacre was so brutal that it prompted the English poet John Milton to write the sonnet On the Late Massacre in Piedmont. Oliver Cromwell, Lord Protector, called for a general fast in England and proposed to send the British Navy if the massacre was not stopped while gathering funds for helping the Waldensians. Sir Samuel Morland was commissioned with that task. He later wrote The History of the Evangelical Churches of the Valleys of Piemont (1658). Only after the death of his mother in 1663, did he really assume power. He was not successful in gaining a passage to the sea at the expense of Genoa (Second Genoese-Savoyard War, 1672–1673), and had difficulties in retaining the influence of his powerful neighbour France. But he greatly improved commerce and wealth in the Duchy, developing the port of Nice and building a road through the Alps towards France. He also reformed the army, which until then was mostly composed of mercenaries: he formed instead five Piedmontese regiments and recreated cavalry, as well as introducing uniforms. He also restored fortifications. He constructed many beautiful buildings in Turin, for instance the Palazzo Reale. He died 12 Jun 1675, leaving his second wife as regent for his son. He is buried at Turin Cathedral. Charles Emmanuel II also recognized five of his illegitimate children by three different mistresses. 1 2 Oresko 2004, p. 18. 1 2 Oresko 2004, p. 20. 1 2 Oresko 2004, p. 23. ↑ Oresko 2004, p. 26. ↑ Oresko 2004, p. 19-20. ↑ Oresko 2004, p. 21-23. ↑ Oresko 2004, p. 24-25. Oresko, Robert (2004). "Maria Giovanna Battista of Savoy-Nemours (1644-1724): daughter, consort, and Regent of Savoy". In Campbell Orr, Clarissa. Queenship in Europe 1660-1815: The Role of the Consort. Cambridge University Press. pp. 16–55. ISBN 0-521-81422-7. 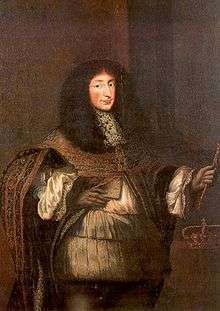 Wikimedia Commons has media related to Charles Emmanuel II, Duke of Savoy.